Mainly for turning wood used cutters of various shapes, or gouges. 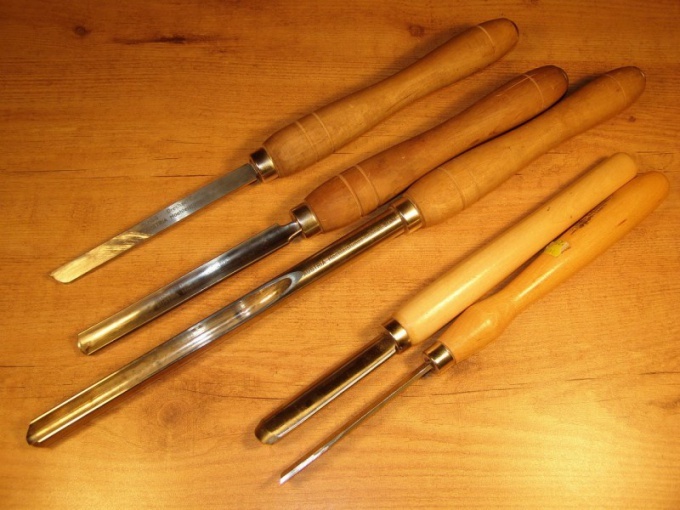 The tool has a handle, if intended for use in the hand, and the cutters for the lathe are missing. Tools for boring wood are divided into three main groups - roughing, finishing and special. Roughing cutter is called Reier. It is used for rough turning of wood and represents a chisel with a semicircular shape. The blade grooved shape, whereby a layer of the wood, the tool removes sufficient. Reyer, sharpened on the convex side of the semi-circle at an angle of 25-30 degrees. After the workpiece is processed by Reier, its surface is rough. In addition to the use for roughing, Reier also used for sampling of internal cavities and turning concave shapes. The Meisel is sharpened on both sides of the knife-chisel, sharpen it at an angle and is used for fine turning wood. They eliminate the roughness on the product and level the surface. The chisel is a knife-jamb, which is confined from two sides under an angle of 20-25 degrees. The cut angle of its blades is 70-75 degrees, and the width of the tool ranges from 5 to 50 mm. the Blade is sharpened to an angle that allows you to work the middle in cases where convex or straight surface are turning. With a sharp angle Meisel profile treated surface completely, they trimmed the ends and cut the product. Obtuse angles are used for turning workpieces with curves. A chisel with a single bevel and a straight blade is called the cutter-scraper. With it, grind out the notch with right angles, it is used in a head-turning, as well as in the formation of round tenons, and the alignment of cylindrical surfaces. To carve recesses and the inner cavity, use the cutter hook. All kinds of shaped cutters, rings and hooks are used for hollow parts and grinding their interior surfaces. They are also used for the outer sections, which need to give a certain profile. In turning woodwork not do without measuring and marking tool. Used calipers, calipers, surface gauge, dividers, tsentroiskatel, templates, t-squares, rulers with support. Various devices exist for fixing the workpiece on the machine, to allow it to rotate. Different methods allow to fix the workpiece over the hole in the center, behind the outer surface. For fixing the center uses a cartridge-Trident center when mounted must coincide with the axis of rotation. For cantilever fastening of the used cartridge is the sleeve, a tubular Chuck, jaw Chuck, faceplate. This type of fastening is necessary to secure the end of the workpiece. Used for grinding of hollow parts, chess pieces, dolls or decorative dishes.